Es gibt keine aktuellen Produkte in dieser Kategorie. Die 'veralteten' sehen Sie unten. The versatility of our datalogger systems allows them to be customized for each application. We offer a range of dataloggers from the most basic system with just a few channels, to expandable datalogger systems that measure hundreds of channels. Scan rates can be programmed from a few hours to 100,000 times per second, depending on the datalogger model. Measurement types, recording intervals, and processing algorithms are also programmable. Dataloggers not only provide advanced measurement capabilities, but can also control external devices. On-board processing instruction sets contain programmed algorithms that process measurements and output results in the desired units of measure. For example, data can be displayed as rainflow or level crossing histograms. These rainflow and level crossing algorithms allow processing for extended periods of time, not just a limited number of cycles. The instruction sets also allow for triggered output with pretrigger data capture capability. Triggers can be based on sensor output, time, and/or user control. For example, if an overpass is being monitored, data collection can be triggered by a sensor detecting the approach of a car, an earthquake, pre-programmed times, or by pushing a button. 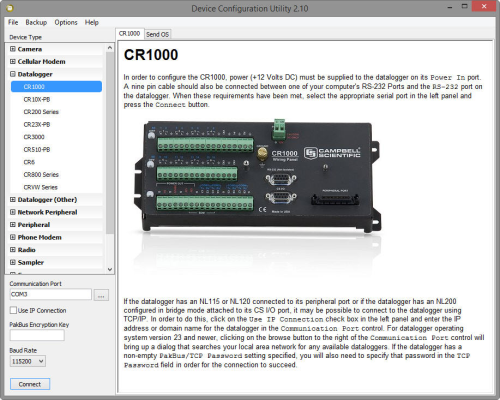 Our configurable datalogger models, the CR9000X and CR9000XC, allow you to customize a system with the channel types that best fit your application. The number and type of channels on most of our dataloggers are expandable using multiplexers and other measurement peripherals. Our dataloggers have input resolutions to 0.33 microvolts, allowing strain measurements with a resolution of a single micro-strain. The following is a list of companies that have developed expertise in our products and provide consulting, installation, and other services for bauwerkszustand applications.